Africa’s lion population has shrunk by 75% in the past 2 decades. They are currently VULNERABLE on the International Union for the Conservation of Nature’s list of threatened species. 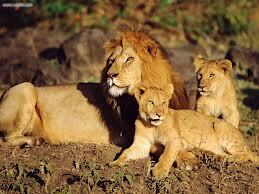 In west and central Africa lions are classified as ENDANGERED. Trophy hunting, human encroachment, poaching, lion poisoning, and human/lion conflict has become a grave concern. In Asia, lion bones are a sought after commodity for healing and traditional purposes. The expanding agricultural sector has led to lions confining themselves to isolated areas, increasing their risk of extinction. One of the biggest threats to lions today is widespread use of pesticides and poison by farmers in retaliation for the loss of livestock. In South Africa around 1 500 lions are killed each year because of trophy hunting. A lot more needs to be done to prevent the species’ extinction. African lions are at risk of extinction by the year 2020 unless drastic measures are taken to conserve them. According to Panthera, a wildcat conservation group, lions have vanished from over 80% percent of their historic range and are extinct in 26 countries. Presently, only 7 countries, South Africa, Ethiopia, Kenya, Botswana, Tanzania, Zambia and Zimbabwe are believed to each contain more than 1000 lions. There will be environmental havoc if lions become extinct. They are the most vital centre point in many ecosystems. If we lose them we can anticipate an eventual collapse of whole environments, right down to the water systems. It would also affect the economic systems of those communities that rely on tourism to survive. This entry was posted in Lions, Wild Species and tagged Africa, Botswana, endangered species, Ethiopia, extinction, Lion, Tanzania, Trophy hunting. Bookmark the permalink. If you actually read the Panthera report you will know they mention that in 20-40 years 50% of Africa’s wild lion populations will face extinction if drastic conservation initiatives are not carried out. Your figure of ‘extinct by 2020’ is hugely misleading. Hi Andrew, thank you for your comment. In that particular sentence I stated that lions are at a risk of extinction by 2020 if drastic measures are not put in place. The sentence that mentions Panthera, simply states that according to their research, lions have vanished from 80% of their historic range and have become extinct in 26 countries. Those are the only stats I used according to Panthera. The previous sentence about lions possibly being extinct by 2020 had nothing to do with Panthera or any report by them. I should step up on correct grammar. The post was not meant to be misleading.